It's no secret that I am a fan of both coffee and beer. Oh, and by the way: I'm now in my 30th year of living with Type 1 diabetes. And if you are here on The Corner Booth, you're quite aware that blogging is something that's also part of my world. Now all of those items -- coffee, beer, diabetes and blogging -- are going to be my writing focus here on my personal blog. Since I'm now only days away from hitting my 35-year mark of life on this rock, I decided it was time for a bit of change. So not only am I focusing more on myself this year, but the writing is going to get a makeover here, too. Just refer to it as: The Diabetic's Corner Booth, 2.0 -- or more appropriately, Brew Point Oh. The focus: Anything written here will have been penned within a coffee shop or microbrew, or the topic du jour will be about java or beer. Hey, and where appropriate: diabetes will be mixed into the brew, as well. As I said, Brew Point Oh. I just love saying that. Makes me smile every time. Spending enough time in both coffee and beer joints, I'm not worried about running out of material. Of course, now approaching my 30th year of living with type 1, I doubt there won't be a D-topic that doesn't warrant a particular personal posts here. You might be asking: How did I possibly come up with this idea? (IN), enjoying a newly-tapped Nitro Stout (which is a bit sweeter than a normal stout that you might find in a store, so I dosed my insulin accordingly). Another patron and I were both sitting and chatting about journalism and the evolution (decline?) of newspapers. Many moons ago, this man had studied photojournalism in school. About 15 years ago, I went to school for journalism. Much has changed in the years since we got our J-Education, and nowadays the industry's struggling and many are either turning away from journalism altogether or realizing they need to have some ability to navigate the world of online journalism. My fellow beer-drinker made a comment, as he looked around the small bar that had about a dozen familiar faces we all knew by name between the two of us: "You know, this would be the perfect place to run a newspaper from. You have people of all colors, just sitting around this bar, and we can all chat and agree or disagree about world events, and do it over a drink." 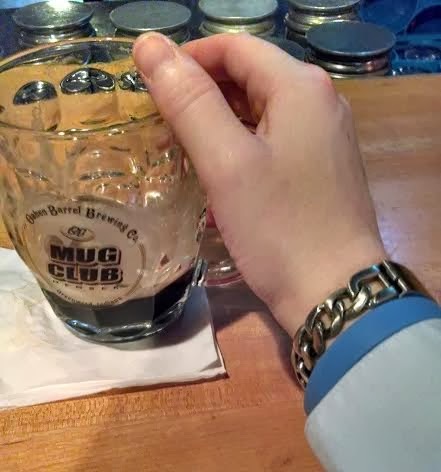 As I scanned the bar crowd and nodded, I also happened to notice that it was a Friday and on my wrist was not only my medical ID bracelet but also a Blue Friday wrist-band. The new focus of The Corner Booth was born. And so, that's the story. For the record, I had three mugs of Nitro Stout at the OB that night. Didn't eat dinner, and I gave myself an extended bolus over the course of a couple hours beyond my time there. Unfortunately, thanks to some insulin pump issues and higher blood sugars lately, my carb-counting for the brews didn't matter much. (For the record: one mug is about equal to two 12-oz beers, so I double up what I'd normally dose for a single extra stout - 15g times two, which is 30g for a mug. 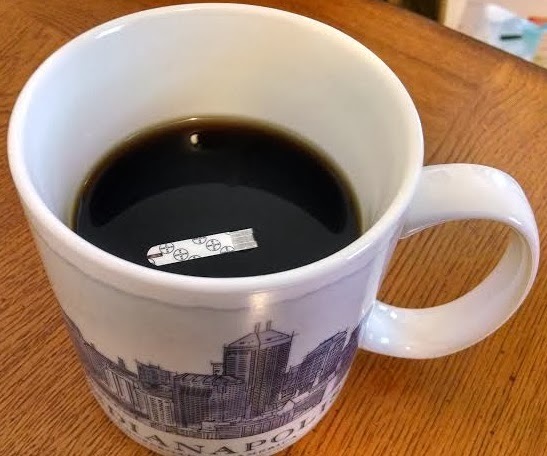 But this particular microbrew is a bit sweeter in taste, so I add a little more and just bump it up to 35g for a mug of this particular beer). Still, based on past carb-counting with more accurate D-tech on my belt, I feel that my carb-counting and insulin dosing was pretty spot on. Hopefully, next time I'll have the chance to see it in effect. In the meantime, this story is what I'm left with. So, I hope you enjoy the new brew here and let me know what your flavor of choice may be, whether it's about beer, coffee, diabetes or just life in general. Looking forward to a new brew of Coffee & Conversation in 2014. Would love to see a follow up with everything the same but a different type of pump. Love this, and I'm a little jealous! I think this theme fits in well considering your home location. Can the word Kismet be used in relation to coffee and beer? I like the name! Sounds cool. Trust yourself. Create the kind of self that you will be happy to live with all your life. Make the most of yourself by fanning the tiny, inner sparks of possibility into flames of achievement. See the link below for more info.